Dr. Athar Osama is a science and innovation policy adviser and consultant and the founder and CEO of Pakistan Innovation Foundation (PIF). He is also the Founder and Chief Executive of Technomics International Ltd – a public policy research and consulting firm. 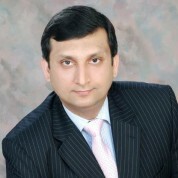 At PIF, Dr. Osama has spearhead fundraising and executive responsibility for developing and delivering several innovation programmes including a National Innovation Grand Challenges (NIGC) initiative, an annual Conference (Pakistan Innovation Forum), a National Learning Innovation Challenge, and a Civic Innovation Initiative for Karachi. Prior to this, Dr. Osama was the Director of Middle East and Asia for Angle Plc. – a UK-based technology commercialization consulting, management, and venture capital firm that specialized innovation programmes, incubators, and research parks in Europe, North America, and the Middle East. From 1999-2006, Dr. Osama worked at the RAND Corporation where he helped designed eCommerce Strategies, consulted on the re-organisation of US Army’s R&D Infrastructure, and helped create the US Army’s Venture Capital Fund. Dr. Osama has advised and consulted for several state and national governments across Asia, Middle East, Europe, and North America and institutions like DfiD, ADB, UN, The OIC, The Carbon Trust, and The Royal Society, among others. Dr. Osama is the Fellow of the New York-based World Technology Network (WTN) and a Young Global Leader (2013-18) for the World Economic Forum (WEF). Dr. Osama graduated with a PhD in public policy from the Pardee RAND Graduate School in Santa Monica, CA and has a Bachelors degree in Aeronautical Engineering from Pakistan Airforce Academy where he won the coveted ‘Sword of Honor’. "Teachers are the building blocks of the foundation on Education Systems are built. They are also, often, its weakest links. All policies, strategies, and remedies fail when they fail to take into account the capacity limitations imposed by this most critical resource in the education system. It is, therefore, absolutely critical to invest in building the capacity of teachers and inspiring them for only tens of millions of inspired teachers can create hundreds of millions of inspired pupil. Despite all the challenges, many many teachers go out of their way and beyond the call of duty to do their best, innovate, inspire, and touch the lives of thousands around them. Many (most) of us are around - and we do what we do - because of one inspirational teacher. And that, simply stated, is the power of a great teacher. The Global Teacher Prize does a tremendous job in seeking to recognise such unsung heroes around us and in the process inspires many many more to take up the challenge of creating our future generations."